If you’re looking to taste a tender, juicy steak or dig into a slice of deep-dish pizza, there’s no better city to be in than Chicago. Chicago is known for its incredible food scene—from red meat and breweries to donuts and pizza—and there are both little gems and high-end restaurants throughout each neighborhood. If you’re wondering where to dine in Chicago, we’ve got you covered. While you really can’t go wrong with any restaurant, these are a few notable dishes you should definitely try at some point in your life. If you can’t make a stop during this trip, don’t worry—that just means it’s time to book your next stay stat. The beef in Chicago is amazing, but this juicy, extravagant burger from Au Cheval is a classic must-have Chicago dish for reason. Hurry on into this upscale “diner” to take a seat and a bite into what just might be the best burger of your life. Make sure to get thick bacon and an egg on top to round it out. However, fair warning—be prepared to wait if you go during busy hours. You might think you’re a devoted thin crust or New York pizza fan, but that’s because you haven’t tried deep-dish. Trust us, you’ll be converted instantly. Thick bread and gooey, oozing cheese—it’s rich and oh-so satisfying. Try Lou Malnati’s or Giordano’s for some authentic deep-dish with the works. Or head to a local shop like Pequod’s Pizza for a pizza pie you’ll definitely remember. Whether you want a dessert or a mid-day sweet snack, the churros from Xoco, a Rick Bayless restaurant, are dipped in chocolate sauce for a rich, indulgent treat that still feels light and easy to eat. Pro tip—order some guacamole and chips while you’re at it, too. What does that mean? It means a hot dog, an order of fries, and the cake shake, which is a chocolate milkshake with actual pieces of Portillo’s famous chocolate cake inside. If the milkshake isn’t if your thing, just get a slice of the cake itself! 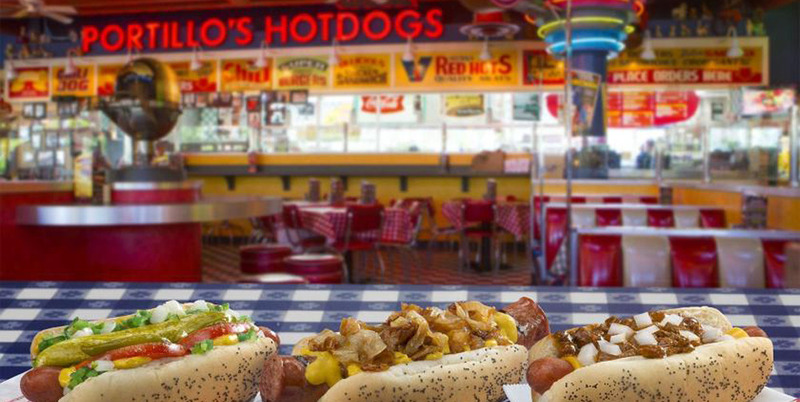 And remember, it’s a Chicago-style dog, so no ketchup. There’s nothing like a beef sub for lunch, and Al’s Italian Beef is the spot to go to in Chicago. Noted as the best Italian beef in the city, it’s tender, lean, and juicy, and it fits perfectly within a soft, warm sub. It has a special secret sauce—a medley of natural spices that really compliment the beef. With sweet peppers to contrast the spice, it’s the greatest sub you’ll ever find. Garrett Popcorn has an amazing popcorn mix that features cheddar and caramel as a classic combo. This dynamic duo hits sweet and savory notes and it’s the perfectly balanced bite you can imagine. It’s too good to put down, so don’t be surprised if your fingers are completely orange in a matter of seconds.